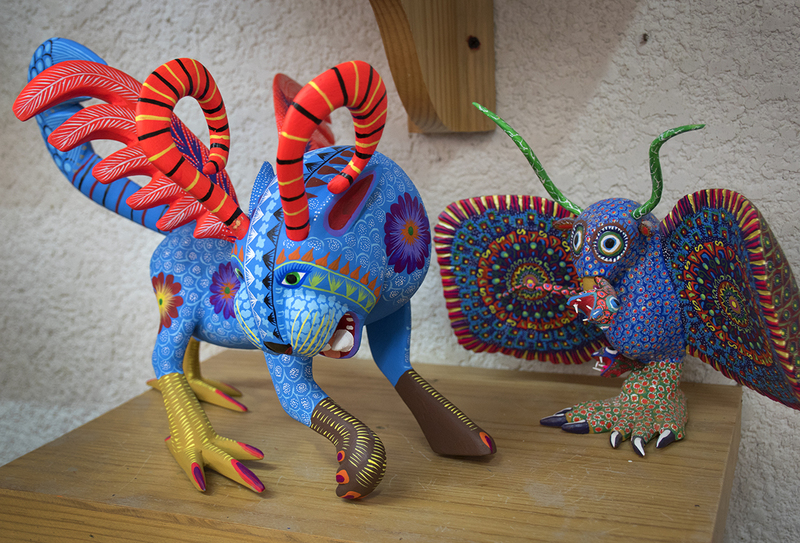 Alebrijes on display in shop in San Martin Tilcajete. In the 1930s, Mexican artist Pedro Linares became very ill and while he was unconscious he dreamed of a strange forest populated with brightly colored fantastical creatures, such as a lion with an eagle head, a rooster with bull horns, and a donkey with butterfly wings. All of the creatures were shouting one word “Alebrijes!” When he recovered, he began creating the creatures he had dreamed of using cardboard and papier-mâché. He called them Alebrijes. His work attracted the interest of a gallery owner in Cuernavaca, and later of Diego Rivera and Frida Kahlo, and he was the subject of a documentary film made about Mexican artisans in 1975. Shortly after this, wood carvers from Oaxaca began reproducing his sculptures in copal wood, rather than papier-mâché, and today that is the region that is famous in Mexico for producing alebrijes. We learned about alebrijes from friends we met while in San Cristobal de las Casas and decided that when we got to Oaxaca we would check them out and perhaps buy one or two. 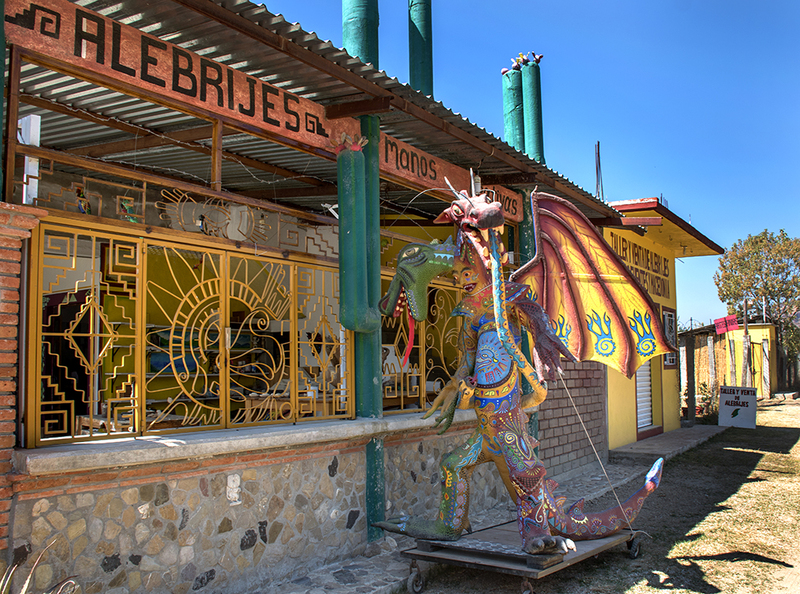 There are three villages outside Oaxaca which are known for producing alebrijes: San Martín Tilcajete, Arrazola, and La Unión. 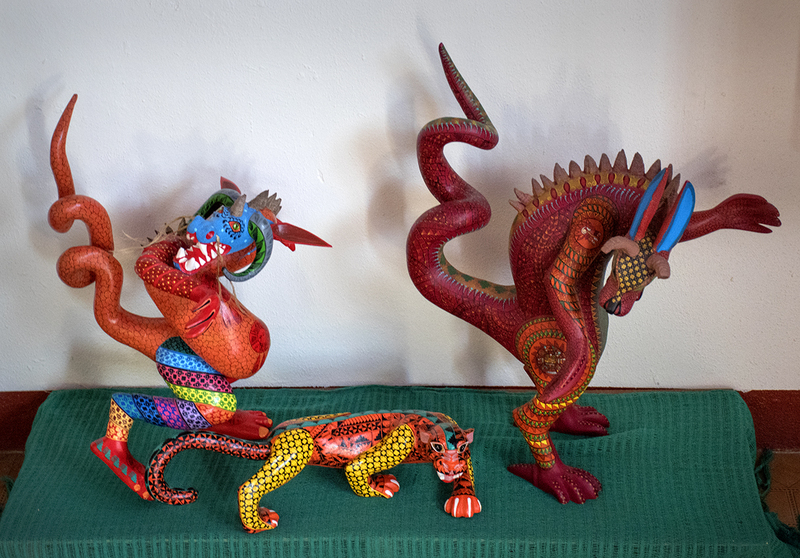 There are also many galleries and stores in Oaxaca where you can see and purchase alebrijes. 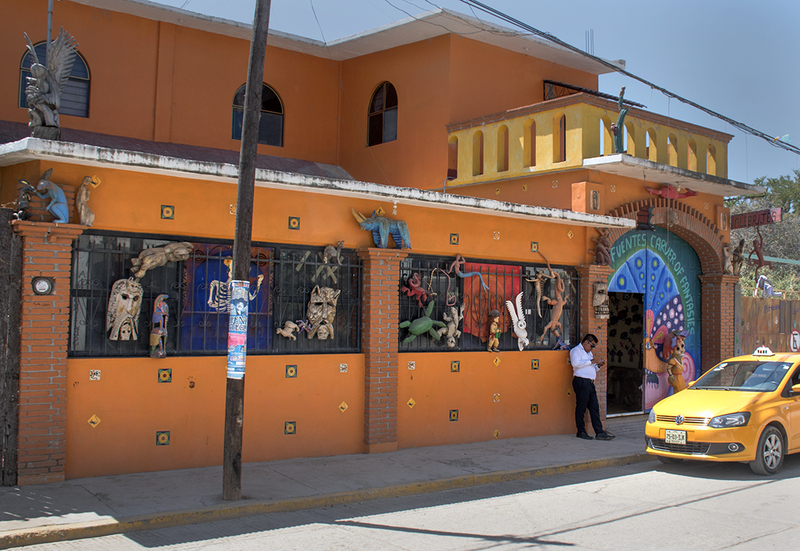 We made a day trip to San Martín Tilcajete to visit workshops and see alebrijes from the source. The village is located about 27 km outside of Oaxaca and we took a colectivo to get there, which dropped us on the main highway, leaving a 1 km walk to the village. It was not an empty walk; along the way there were several shops making and selling alebrijes and we stopped in most of them to see the work. In all, we probably visited 15-20 shops in the village. 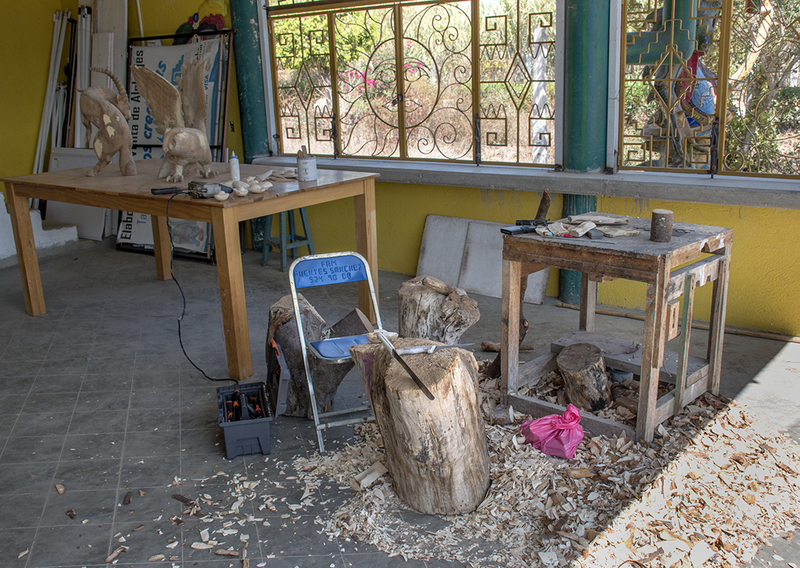 One of the carvers at the Fuentes shop, one of the most famous families of artists in the town, was nice enough to give us a full tour of the process from start to finish. He said that the entire process at their shop takes about four years from cutting the wood to a finished alebrije. Of course this involves many sculptures being worked on simultaneously, not one at a time. After cutting, the wood is dried for a couple years and then soaked in gasoline for a few weeks (to prevent insect infestation), then dried again and stored. When it is ready to use, cracks in the wood are filled and sealed. Then the wood is carved, sanded, and painted. The painting is done in layers, and at the Fuentes shop much of the work on the final layer was extremely intricate, done with tiny brushes. Our guide said the best pieces can take more than three months to paint. We thought the work we saw at this shop was the best of any of the shops we looked at in the town, but any idea of being able to pick up a high quality alebrije for $100-200 were quickly dispelled when we saw the price tags of alebrijes there. Most of the pieces we admired were in the $800-1100 range. It became obvious when looking at many different shops that the major distinguishing difference between lower and higher priced alebrijes was the intricacy and detail in the painting, which is likely the most time consuming part of the process. The better quality pieces are always signed by the artist. We left the village without buying anything. I was a bit disappointed in the number of alebrijes which we encountered that were just painted animals. The original alebrijes were supposed to be fantastical creatures which were formed from two or more animals melded together. We didn’t see a lot of these types of alebrijes, although the Fuentes shop and a couple other shops in San Martin Tilcajete had some. We resolved to check out what was available in Oaxaca and over the course of the next week we visited many shops and galleries in town that had alebrijes. The most impressive, and most expensive alebrijes we found in Oaxaca were at Voces de Copal, a gallery/store on Calle Macedonio Alcalá. 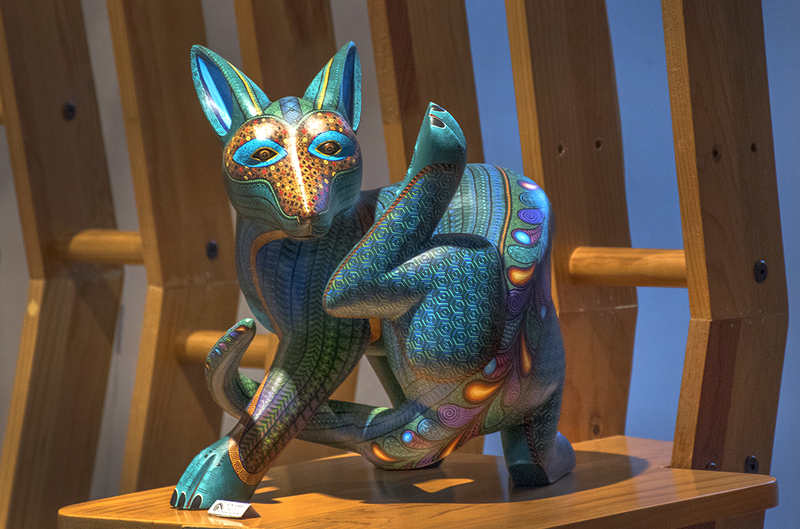 The gallery features the work of María y Jacobo Ángeles, maybe the most famous alebrije artists in Mexico. The highest priced alebrije of theirs I saw in the shop was 40,000 pesos, or about $2150. Fortunately, not all shops in the town were this expensive. In fact, the prices in Oaxaca often seemed better than in the village we visited. We found several shops in town which had some nice alebrijes for less money. We ended up buying two colorful smaller signed armadillos (our favorite animal) in our price range, which were very good value considering the detail of the painting. Fox in Voces de Copal in Oaxaca, by María y Jacobo Ángeles, priced at 40,000 pesos. Our advice if you are considering shopping for alebrijes in Oaxaca is to visit one of the towns first to get an idea of the range of quality you can find, particularly in the painting, then shop around after that. Alebrijes we were impressed with at the beginning of our quest, which we returned to look at later, didn’t seem so impressive once we’d seen the really good stuff. Once you have an idea of the quality range and prices you will be better able to spot a bargain when you see it. Really cool pieces of art; have never seen or heard of them.